The Castine Historical Society offers an internship opportunity for a graduate student enrolled in a museum studies, public history, archival science or related Master’s degree or Ph.D. program. The internship is full time (35 hours per week) for 10 weeks in the summer of 2018 with a stipend of $2,800. The Society will work with the student to structure the internship to meet requirements for academic credit as needed. The Castine area, a beautiful and historically significant town on the coast of Maine, saw millennia of use by Native Americans before European contact and changed hands repeatedly from the outset of the colonial period through the War of 1812. The peninsula’s development in the nineteenth and twentieth century represents a microcosm of American commercial and cultural history. 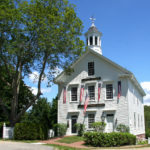 The Society occupies two historic buildings on Castine’s town common and is a 501(c)(3) membership organization with a paid staff of three and an active volunteer Board of Directors. Changing and permanent exhibits are hosted in the Society’s 1859 Abbott School. In 2015, the Society completed construction of a climate-controlled, fireproof storage facility, research center and administrative offices located next door in its restored circa 1850 Grindle House. This internship is designed to provide a graduate level student with service to the history field while he/she gains experience with professional staff in a local history setting. 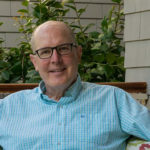 In addition to the projects outlined below, the intern will be included in the regular, day-to-day activities of the Castine Historical Society. While the internship will take place mostly on weekdays, some weekend hours will be required. The Society will provide the intern with information about housing rental options in the area. The Historical Society’s historical collections are at the core of the Society’s mission andprograms. The intern will work with manuscript, photograph and/or artifact collections, depending on his or her previous experience. Projects will offer practice in one or more aspects of collections management and reference. This learning opportunity can be tailored to help the intern develop needed skills. 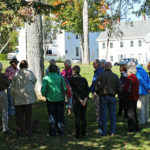 Working with a Society volunteer, the intern will offer a weekly guided walking tour of Castine’s history. 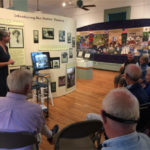 Approximately 20% of the intern’s time will be spent preparing for the tours and gaining experience sharing local history with visitors and residents. The intern will be involved with exhibit research and planning in support of the 2019 seasonal exhibit titled Risky Business: Castine Shipping 1820-1870, an interactive exhibit about Castine-built ships transporting cargo around the world. Supervised by the curator, assignments include researching, drafting exhibit text, and participating in design meetings. Send the following by Tuesday, March 20, 2018, to Paige Lilly via email at curator@castinehistoricalsociety.org (please include the word “internship” in the subject line) or by post to Castine Historical Society, P.O. Box 238, Castine, Maine 04421.